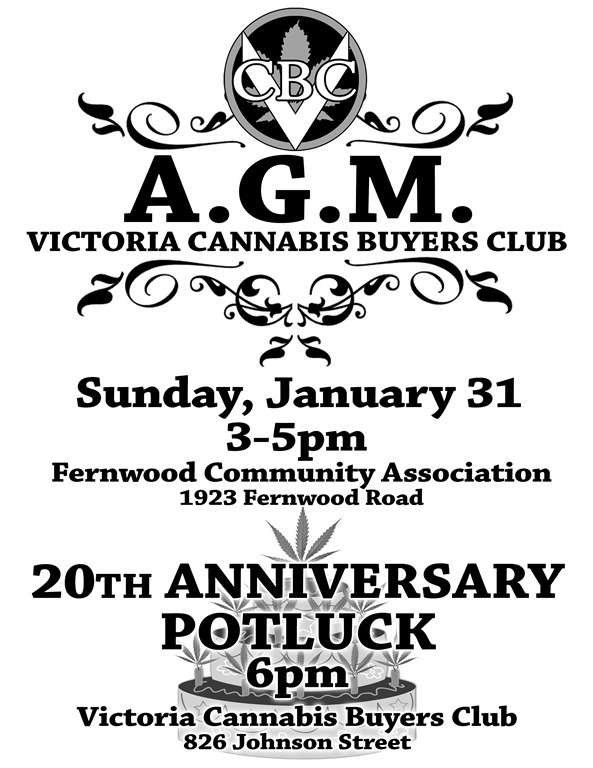 On Jan 31, 2016, the Victoria Cannabis Buyers Club will be celebrating its 20th anniversary with a potluck party to follow its Annual General Meeting. The organization has come a long way since those days, two decades ago, during which I was supplying cannabis products by delivering to patients from the van in which I was living. This last year in particular was incredible on two counts. Our former head baker, Owen Smith, won his case before the Supreme Court of Canada, changing the laws to allow the use of cannabis extracts; and the city of Victoria announced that since there are now so many dispensaries in town, it is prepared to license them as businesses. 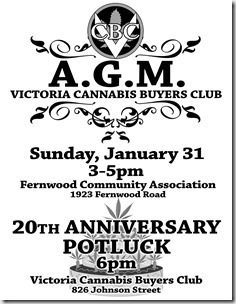 This will only be the third AGM of the VCBC, as it was just a few years ago that I turned it into a non-profit society. Since that time Dieter MacPherson has managed the club as both president of the board and executive director, with a number of others supporting him on the board. With the organization possessing such great potential, it will be exciting to see who is ready, willing and able to help take it to the next level. While it is a great achievement for dispensaries to get a license, there is a very real chance the city will force the club to close its beloved smoking room. This safe inhalation site deserves to stay, and the city should instead be allowing others to open. They are a benefit to the local economy, and provide a safe place for people to gather and peacefully smoke herb with their friends. There will only be a few opportunities to help us address the council to persuade them to reconsider this position, so if you are interested in helping, stay in touch with the club. 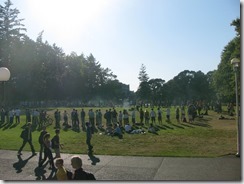 Several guest speakers have helped fill my place at the weekly 420 circles that the UVSS Hempology 101 Club hosts in the center of the UVic campus. 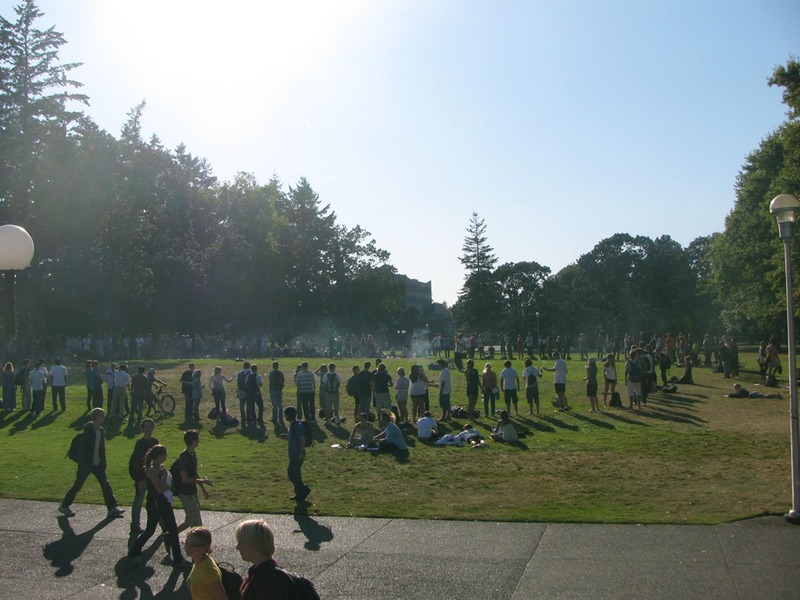 With a steady crowd showing up each week, Hempology 101 has remained the largest student club at the University of Victoria for almost a full decade, and will likely hold that position for quite some time. It has been wonderful to get so much help keeping the meetings going every week in my absence. Our annual Halloweed costume contest at the courthouse was a grand success. Thanks so much to our sponsors the Beard Bros, Sacred Herb, Jupiter, BC Smoke Shop and Crop King Seeds for all of the prizes. However, the biggest thanks goes to the Victoria police officers who were willing to stand guard on the street for us, to protect us from drunks as we held the contest and hot-boxed the courthouse steps. While it is a pain being hassled for trespassing at the courthouse, it is always fun for me to convince the police they are better off not enforcing the law and letting us have a good time. 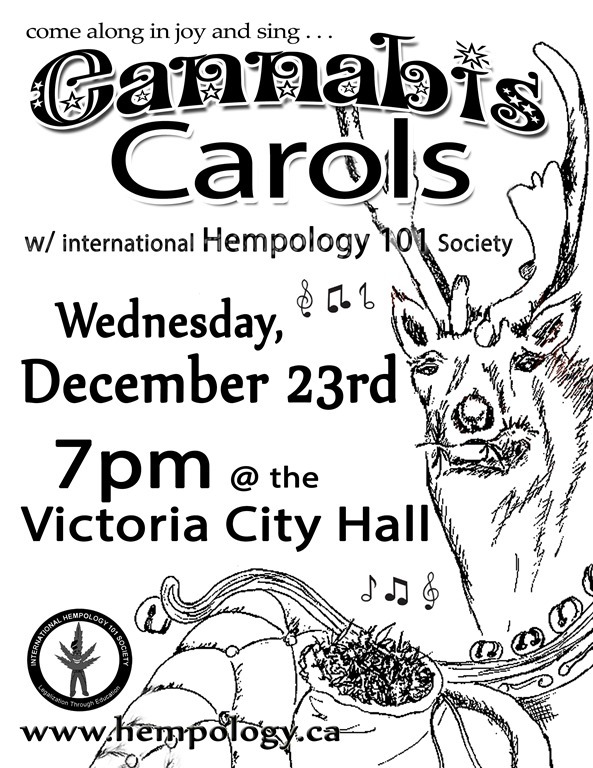 A small but dedicated troupe struck out days before Christmas to cannabis carol around downtown Victoria. Unfortunately circumstances did not allow me to attend, as singing songs about cannabis and singing very loud about it on the streets tickles my fancy. Since it is winter, there are no other big events to look forward to until the big day on April 20. Of course the big news lately has been the election of the new Liberal Government and their vague plans to legalize cannabis. Now that they have named former Toronto police chief Bill Blair as the person responsible for outlining the plans, there will be a lot of lobby efforts made by Licensed Producers for them to fully control the supply of legal herb. This plan threatens the livelihood of the growers who have supported clubs like the VCBC for years, and is not in the best interest of consumers, police or producers. The best plan would allow easy entry into the marketplace for growers wanting to sell their wares but with a history of supporting big business that might not be what the Liberals will do..
Whatever the future holds you can be sure the Cannabis Digest will be there to report it. Smoke ‘em if you got ‘em.